I love running local races because it’s cool to realize just how many runners are nearby – though I always wonder why I never see any while I’m out. Even on Friday night, the forecast was flirting with Saturday morning showers, so I told my running buddy it would be a game time decision – after a long week, I wasn’t digging a cold, windy, wet run. Rain woke me at 5 AM but it had stopped by the time I got up. As dawn broke, the clouds parted and it turned sunny, but the strong winds out of the N-NW made the start-time windchill a brisk 41 degrees. I haven’t run in the cold yet, so I grabbed a cotton zip-up hoodie and dug through my cold weather gear bin for gloves, but could find only one that wasn’t leather or turquoise suede (when did I buy THOSE?!?). Some people were wrapped in blankets with mittens while others wore shorts and sleeveless shirts. I secured my bib across my hoodie, using extra pins so the wind wouldn’t whip it around. I washed my hands with the water outside a port-a-john, and my fingers froze instantly – apparently that water had been sitting outside all night. Refreshing! I heard people grumbling about the hills as we lined up at the base of one. Great, I thought, craning my neck to look up, it’s a nasty one, but we’ll get it out of the way at the start. I stretched a bunch and jogged around, trying to warm my muscles. The gun went off with little warning and we slogged our way up the first giant hill. After that it gets blurry. I know there were at least five big hills, possibly six. It seemed like we never went downhill, though. A girl running next to me at one point asked how this was possible – the organizers had found a route with (what seemed like) six uphills but only two downhills. I did walk for two short spurts. At first, my legs were stiff and cold and just couldn’t make it up the third (or was it fourth?) hill. By mile three or so, I was absolutely roasting, but I had pinned my bib very securely across my hoodie, bridging the zipper. I could unzip it, but my numb fingers couldn’t work the safety pins to reposition the bib, and the hoodie was snug enough I couldn’t get it over my head. I tried rolling up the sleeves but that didn’t really work, either. I really need to learn how to layer for colder days and get a good technical sweatshirt. Most of the race was through residential areas, and several houses had been freshly tp’d before the rain, so there were people out cleaning who cheered us on. In general, I was surprised by the number of spectators, all of whom were very enthusiastic. A few were on bike and cheered at a couple different places along the route. Even some of the cops blocking off streets were yelling encouragement as the runners passed. The wind was blessedly at our backs most of the last mile, until we turned and ran back down the giant hill we started from. I kicked it into gear and passed two people, which felt great. I need to remember that feeling so I don’t start too fast again! I finished at 43:02, a 9:55 pace. I didn’t know what to expect for a 7k, so my unofficial goal for a “challenging” but unknown course was sub-45 minutes. As soon as you crossed the line (and they ripped off the bottom of your bib), the organizer shook your hand and gave you a medal. It’s my very first medal, and even though it’s generic, with no race name, date or anything on it, I grinned when I put it on. I finished 39th out of 76 in my “division.” They only had two divisions for each gender: Under 15 and 15 and up, which seems odd. The winner finished in a blazing 24:57 – a pace of 5:45. Incredible! The post-race was nicely done, with small Chinese take-out boxes next to bins of trail mix ingredients, so I mixed together granola, raisins, dried cranberries, chocolate chips and almonds. Great, healthy post-run snack! There was plenty of piping hot coffee and hot chocolate too. We wandered by the river and watched the crazy people fishing in knee-deep water, and chatted with other runners. Overall, a very tough course, but I would do this race again – and maybe break 40 minutes. Mile 4: No idea – There was no sign, just some woman with a stopwatch, and I didn’t realize she was the mile marker until I had passed her. 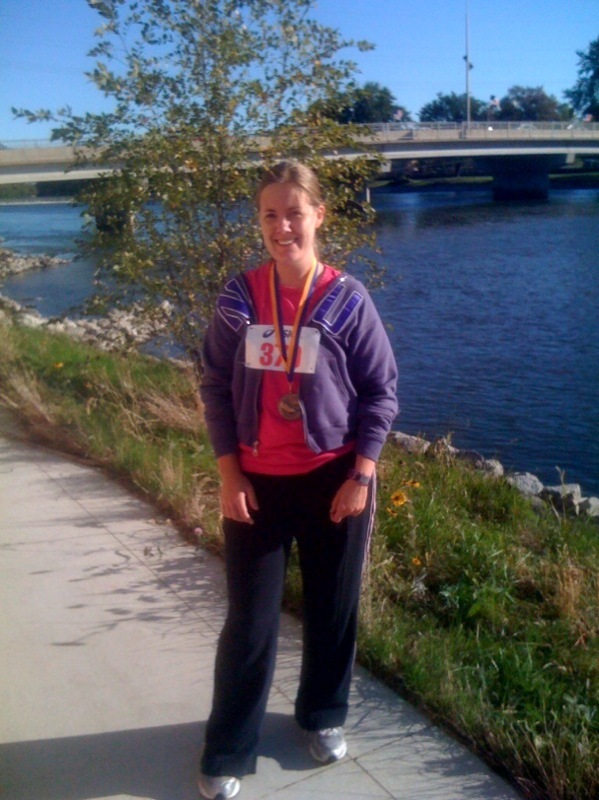 This entry was posted in Fitness and tagged Running. Bookmark the permalink. That was a very interesting read Crysta! I ran the Harvest Hustle last year and it was definitely a challenge. It was my first race too which made it that much harder. It was satisfying to get a medal in the end for finishing. This is the only race I’ve run where they do that. Unfortunately I couldn’t attend it this year but perhaps next year we will see. I have my first 10K tomorrow morning in downtown Arlington Heights which should be challenging but a lot of fun. I will need it as I am training for my first half marathon at the end of November. Have you always been into running? What got you into running? If you are interesting in coming to learn about a new race I am developing, come to the Elgin Public Museum on 10/26 from 7 – 8:30 PM. I am starting up the Jurassic Classic again to benefit the Elgin Public Museum and we definitely need all the help we can get. If you can’t attend, that is okay. I can email you information from the meeting. Just send an email to the one I used here. I look forward to hearing about your future runs. Perhaps I will see you at the Sycamore Pumpkin Run 10K on Halloween.